Visitors turn out for giant sharks! 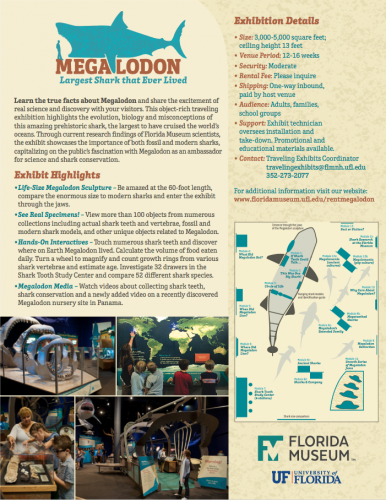 With more than 1.5 million visitors, Megalodon continues to attract large audiences and increase attendance numbers for host institutions. This 5,000-square-foot traveling exhibit highlights the evolution, biology and misconceptions of Megalodon, an enormous prehistoric shark that once cruised all the world’s oceans. Related to the modern great white and mako sharks, Megalodon was a dominant marine predator for 15 million years before vanishing 2 million years ago. The exhibit conveys current research findings of Florida Museum paleontologists, and showcases both fossil and modern shark specimens and full-scale models from several collections. People have collected Megalodon teeth for thousands of years, and today Megalodon has near-cult status. The exhibit capitalizes on the public’s fascination with fossil sharks as ambassadors for science and shark conservation. Be consumed with awe, walk away with respect! Walk through full-scale jaws into a 60-foot-long Megalodon sculpture and begin to explore the story of this fantastic ancient creature – its size, structure, diet, lifespan, relatives, neighbors, evolution, extinction and the science that continues to reveal Megalodon’s tale. Tooth-shaped island units support interpretive materials, which include graphics, hands-on components, and family- friendly interactives. The exhibit is object-rich, including numerous fossil specimens from several collections, and life-size and scale models of other fossil and modern sharks. Megalodon, a dominant marine predator for 15 million years before vanishing two million years ago, provides lessons for shark conservation today. Enter the shark to begin exploring. If Shark Teeth Could Talk…. Shark teeth can identify the species, suggest body size and indicate prey or prey size. Touch a full set of 46 Megalodon teeth, and view real specimens showing tooth differences between upper and lower jaws, male and female sharks, and sharks’ unique system of tooth replacement. This Was One Big Shark! Scientists still debate Megalodon’s size. Measure a series of hands-on Megalodon teeth to predict the size of each shark. Growth rings are visible in shark vertebrae or “centra,” much like tree rings, and indicate a shark’s age at death. Turn a wheel with shark centra to magnify and count rings to estimate age. Megalodon was the top predator of its time. Calculate the volume of tuna cans that represents an average daily meal. Megalodon lived from 17 to 2 million years ago when the world’s oceans were generally warmer. Compare Megalodon’s time on earth to dinosaurs, humans and other animals. See fossils of some of Megalodon’s neighbors. Megalodon lived throughout ancient oceans. Touch Megalodon teeth from around the world and with buttons locate where these fossils were found on a world map. Shark teeth are the most commonly collected fossils. Bring your own shark teeth or use those provided to compare to the 52 species on display. Watch video of kids collecting fossil teeth in a Florida stream. Megalodon is related to mackerel sharks, including the modern great white and mako. View mackerel shark specimens and identify what makes them unique. Megalodon belongs to a group of giants called megatoothed sharks – all now extinct. Discover when each species lived and see the diversity of their tooth shapes and sizes. Sharks have been around for over 400 million years. View models of some of these curious early sharks and the specimens that give us clues. There are more than 375 species of sharks living today. They are related to skates, rays and ratfish. See specimens of these fishes and view six full-scale models, including a 16-foot great white. Several factors caused Megalodon’s extinction about 2 million years ago. Climate change and shifting food resources are part of the story. Learn about extinction and guess which of five modern animals are in danger of extinction today. Megalodon teaches us about shark evolution and shark conservation today. Learn what you can do to help. Who Needs Sharks? You Do. Watch video about shark conservation and pull a lever to reveal the role sharks play in ocean health. The Florida Museum of Natural History has one of the most active shark research programs in the world. Watch a video about shark research. Megalodon has intrigued people for thousands of years, and still intrigues us today. View Megalodon teeth used by ancient Native Americans, and see modern books, clothing and jewelry inspired by Megalodon. There are plenty of common misconceptions about sharks. Compare Megalodon’s place in time to dinosaurs and humans, and learn how unlikely it is today to be attacked by a shark. View four Megalodon jaws from 30- to 60-foot-long sharks – a perfect backdrop for family photos.